While some may feel the heyday of Miami’s performing arts scene has passed, the Unity Coalition will not let those who have shared their talents with the community go unnoticed. The Unity Coalition’s Leaders, Legends & Lovelies Ball will once again celebrate and honor those who have made a positive mark or contribution to the LGBTQ community. 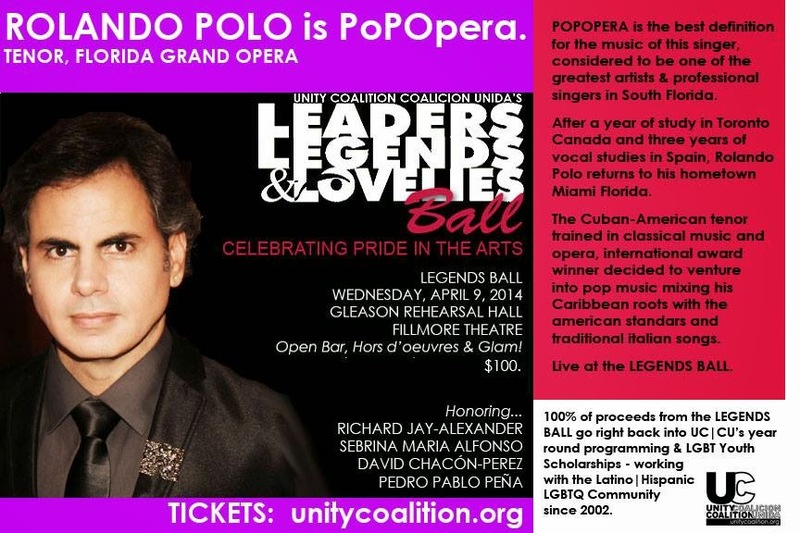 This year’s fundraising gala, held on April 9 in the Jackie Gleason Rehearsal Hall at the Fillmore Miami Beach, will celebrate “Pride in the Arts” honoring Sebrina Maria Alfonso, David Chacón-Perez, Richard Jay Alexander, and Pedro Pablo Peña. The evening, usually one of the highlights of the Miami community’s season, will feature live music and entertainment including special performances by singer Maryel Epps, Florida Grand Opera's tenor Rolando Polo, singer Richard Araujo, South Florida Symphony, DJ Romullo Azaro, and CIRC X & Cynosure. This year’s Impressive honorees are all accomplished in their fields. Sebrina Maria Alfonso, conductor for the South Florida Symphony, was the first Cuban American conductor invited to conduct Cuba’s premier orchestra. David Chacón-Perez, a producer and artistic director, has participated in over 100 television, special event and theatrical productions. Richard Jay-Alexander, a producer and director, has worked in television, film, video, commercials, and recordings with some of the biggest stars in entertainment including Barbra Streisand, Bernadette Peters and Kristin Chenoweth as well as working on Broadway with blockbusters like Les Misérables, The Phantom of the Opera and Miss Saigon. Pedro Pablo Peña, former dancer with Havana’s Opera Ballet, the National Ballet of Cuba, and Musical Theater of Havana, is the Founder and Director of Creation Art Center Miami Hispanic Ballet, the International Ballet Festival of Miami, Cuban Classical Ballet and is currently General Director of the Miami Hispanic Cultural Arts Center. The host committee for the event includes Dr. Ken Wilcox & Nicol Pindelea (co-chairs), Chris Aguilar, Max Brava, Walker Burttschell, Angel Camacho, Jane Castro, George Coronado, Francesco Duberli, William Dionne, Michael Gongora, Luis Gonzalez, Maria Lago, Aryah Lester, Weslee Lim, Tony Lima, Diana Laura Noris, Chris Padron, Angela Salter, Herb Sosa, and Michael Stein. This year’s event promises to be a stellar event and tickets are still available. Besides the incredible entertainment there will be an open bar and hors d'oeuvres. 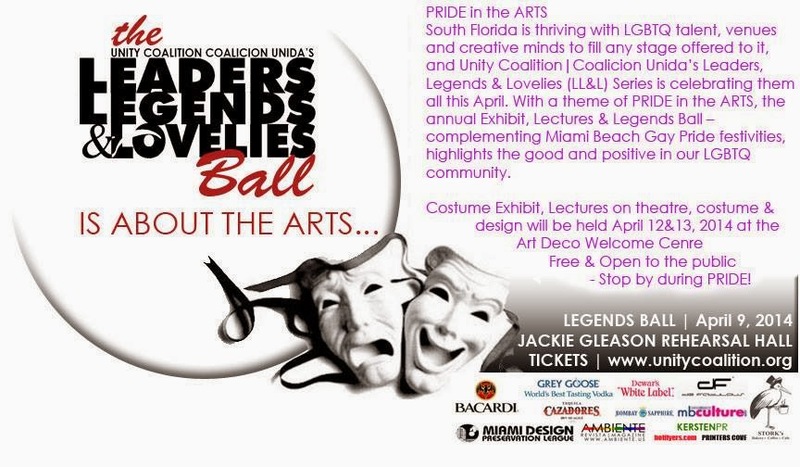 The Leaders, Legends, and Lovelies Ball will be held at 7 p.m. on April 9 at the Jackie Gleason Rehearsal Hall at the Fillmore Miami Beach, 1700 Washington Avenue, Miami Beach (enter on the south side behind the theatre off of 17th Street). For more information visit www.unitycoalition.org.